Exercises to Get You Swimsuit Ready! Unless you’re living in the UK and still waiting for the clouds to disappear, the sun must already be out in your City. But don’t panic if you’re not beach body ready yet! Take a deep breath, then dive into this total-body sculpting series. Do it six times a week, pairing the exercises with 30 minutes of cardio, for a trimmer, firmer you. Do all moves on one side first, then the other. Sit face up with feet flat on the floor. Tuck knees into chest and roll onto back. Roll back down, bringing left hip and hand to the floor. Place left knee on the floor, rotating hips to lift up as you extend right leg out to the side. Rotate hips back down to return to roll: repeat 30 times. Pro tip: Make sure you are not rolling on your neck. Kneel on left knee with left hand on the floor, right arm resting on hip and right leg lifted (knee bent) so that inner thigh is parallel to the floor. Pull right knee in toward shoulder and then extend leg back and up. Return to “A” and repeat 30 times. Pro tip: Extend all the way through your toes. Start in the bottom of a push-up. Push into the floor to rise to the up part of a push-up, then lower back down. Lift back up to plank as right leg sweeps up and out to side. Bring leg back in and lower it to the floor. Repeat 30 times. Pro tip: Keep your hips down. One of the most efficient workouts around. 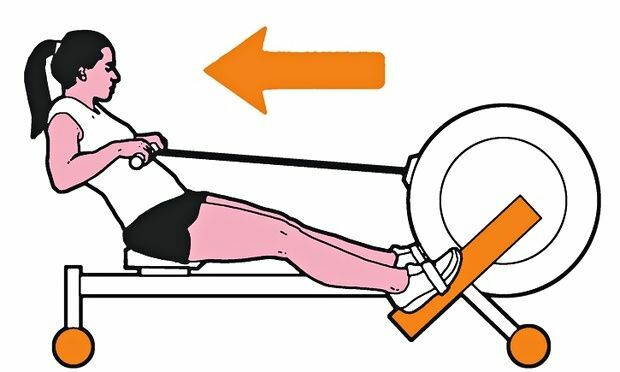 When you row, you’re using your whole body – upper, lower, core – simultaneously. Plus your heart rate stays elevated throughout the entire session, so think of it as a spin class complete with leg-presses and pull-downs. Pro tip: Personally, I could spend around 30 minutes. But start of around 12 – 15 minutes. Surprisingly the leg press is excellent for working on your glutes as well as giving your legs that desirable look. Load up a leg press machine and keep your legs straight. Powerfully contract your calves and press the platform up as far as possible. Hold for 5 seconds and release back as far as possible. Pro tip: Lower the weights and push the machine with one leg 10 times, then both legs 10 times, then other leg 10 times. Repeat this rep 4 times. Posted on 4th June 2015 by Christina Helen Brown. This entry was posted in Weight Loss and tagged beach ready, cardiovascular exercise, dubai exercise, exercise, squats, swimming lessons dubai. Bookmark the permalink.